If you are a Nepal Telecom (NTC) SIM user, there is a must have app for all of the major tasks. It is the official app of Nepal Telecom (NTC). Although the Nepal Telecom app was launched a few years back, they have revamped some of the features in the app to make it a must-have. Your day to day NTC mobile usage has become convenient. You will find the top ten reasons to use the Nepal Telecom app in this post. Although most of the features/services are for their GSM mobile, there are still some for CDMA mobile (Prepaid/Postpaid and landline. Once you download the Nepal Telecom app, now you need to register your mobile number in the app and get more functionalities inside. Let’s find it out. 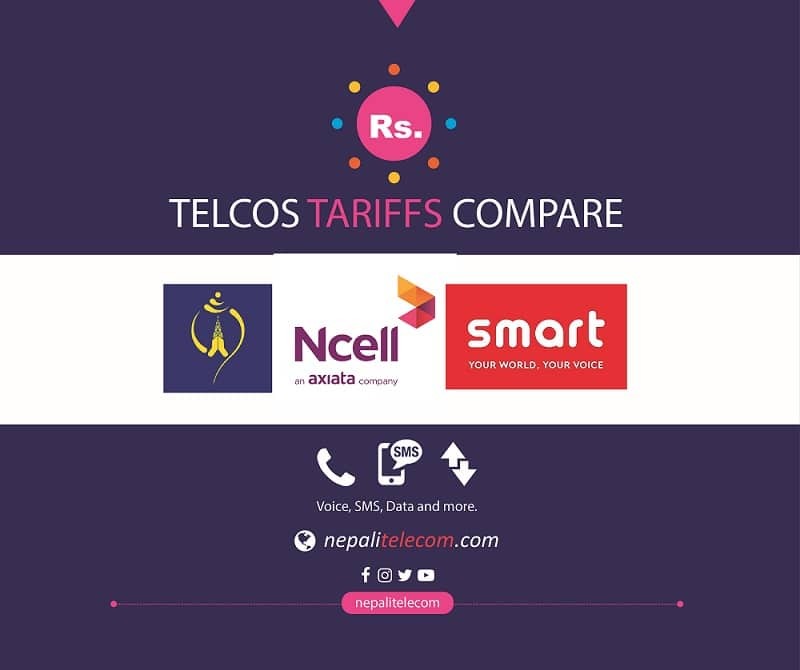 With the Nepal Telecom app, the balance will display on the front page of the app. It is very convenient to check the balance without dialing any code or number. In case of postpaid, remaining Credit means the balance you can actually use and due amount means the amount you are billed for the month. Nepal Telecom app also lets you check the remaining data volume or minutes of the data/voice pack you have subscribed. You can also find the validity of the subscribed or gifted packs. Most of the data/voice packs available in Nepal Telecom are listed in the Buy packs section of the app. You just have to select the pack you prefer and click buy packs. Its a hassle-free task without the need to dial other numbers and search the packs somewhere inside. In the app, you can also recharge your Mobile number with a PIN code or scanning feature. People find difficult to remember the several code and number for the recharge, so it makes very easy for this task as well. This feature is only for Prepaid number. If you want to send some balance from your number to another one, then this feature comes handy. Likewise, you do not need to remember the security code (which is a major problem for most people). Just go to the transfer balance section, put the mobile number for which you want to send and the balance amount itself. With the latest revamp of Nepal Telecom app, Gifting packs to your friends/family have been accommodated here. Now you can easily gift certain packs to another NT number (either prepaid or postpaid). But the packs to gift are limited, as they only have MCA, all time data and voice packs there. The app is also one stop for information of all their services, tariff, company info, social media, and latest offers. You can find that information in a separate section of the app. Friends and family (FNF) feature of Nepal Telecom provides discounted call rate to 5 NT numbers, either landline, prepaid or postpaid (GSM or CDMA). As the previously defined procedure is complex, people find it difficult to add the numbers for FNF. Whereas it can be done very easily here. Just add the numbers you want to put it for FNF, and you will get the discounted call rate to those numbers. Find the tariff of FNF. NT app also lets you subscribe value-added service like MCA (Missed call alert). Just go to VAS section, you will find MCA there. If you have already subscribed the service, it will show the subscription status there. Or you can easily subscribe from there. 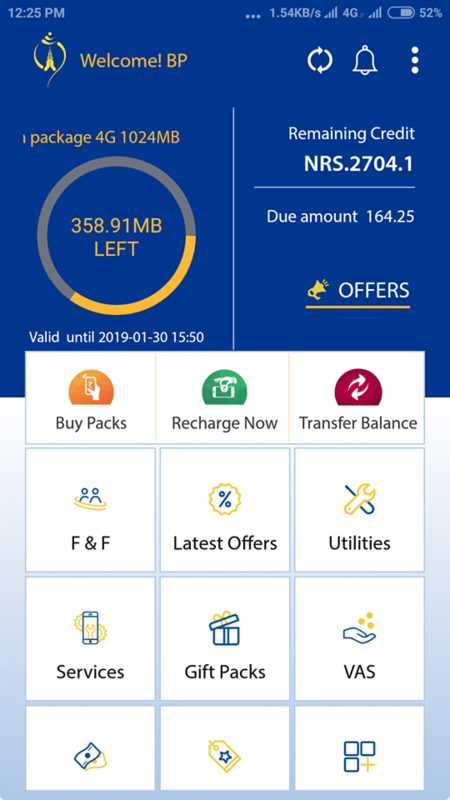 If you have a recharge card and you want to pay the bill of other Nepal Telecom services like ADSL, landline, the app lets you do without the need to remember the web link or numbers. You can also go to web recharge portal link from there. Bonus: Now, there is one more reason to use Nepal Telecom app. If you are a new user who register in the app, you will get 100 MB as a data bonus. This bonus in the app was first launched with the NTC anniversary offer. Now it is also available with Spring offer. All in all, Nepal Telecom app lets you do regular subscription and other tasks in a very convenient way, without any hassle.